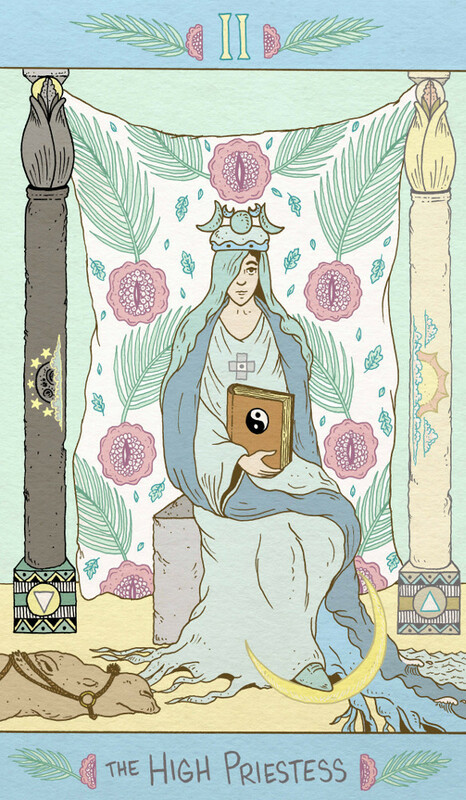 This week’s card from Mike Medaglia’s Luna Sol Tarot is The High Priestess. It is another beautiful card bursting with meaning. When talking about the tarot, especially the Major Arcana, you sometimes wonder how much you should share. Partly, there’s a sense that if everything is said then nothing is heard – if you micro-analyse each symbol, then is anything at all taken away by the reader? There is also one of the principles of what we call four pillars, namely “To be silent” or “Keep the silence”. If taken literally, that is quite a tough requirement when writing about the tarot! As a symbol of sacred secrets, this all comes to mind when thinking about The High Priestess, the deeply feminine presence who is the keeper of both the tarot and its mysteries. And there is a strong emphasis here on the word mysteries. For example, in the tarot, The Moon is not necessarily the moon; The High Priestess is the moon. Or, the camel at her feet in the Luna Sol is not a camel; it is a letter that speaks of camels. A common feature in many decks are the columns that stand on either side of The High Priestess. Usually one black, one white; sometimes with a letter J on one and B on the other. These are the columns at the porch of the Temple of Solomon, Jachin and Boaz. Thus The High Priestess sits at the entrance to the Temple. These columns are sacred to several paths, but let’s look at what they mean in the tarot. The white pillar, Jachin, is affirmation or establishment and the dark; Boaz is negation or inertia. The High Priestess is a balancing force between these two natural and necessary powers. Maybe this a process the book upon her lap describes, but it would not be surprising if the language it used was poetic and in need of intuition to interpret the meaning! If you feel my explanations are veiled … good! Welcome to The High Priestess. Now, let us give her some quiet time. Take a moment to reflect on the known unknowns – those in your circumstances and, perhaps more importantly, within yourself. Intuition is called for. Pay quiet attention to where your stream of consciousness flows. And now for some Liminal 11 news! We promised big tarot news in our last blog… With the announcement of our publication of Lisa Sterle’s wonderful Modern Witch Tarot next year, hopefully you’ll agree we’ve delivered! This is such an incredible deck! Lisa, together with Matthew Erman, is behind the critically-acclaimed horror comic Long Lost, and she is starting a new series Submerged with Vita Ayala (coming July 2018 from Vault Comics). 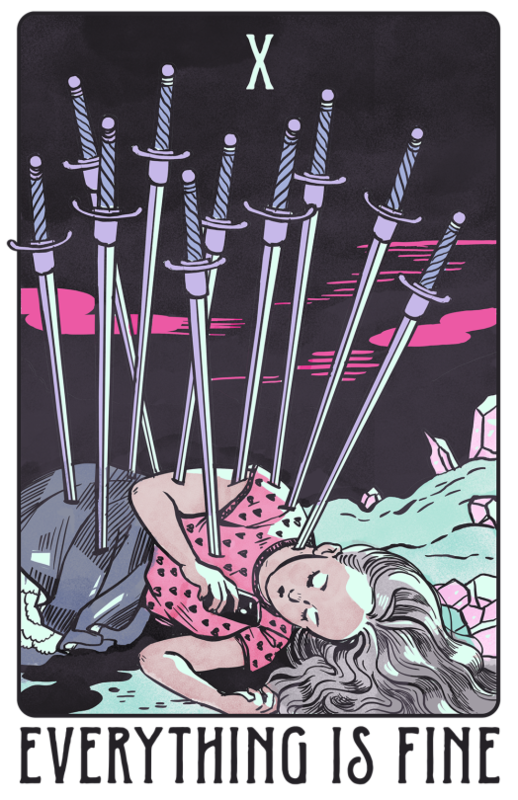 The connection with strong female characters and a sense of affinity to magic shines both in her comics and in The Modern Witch Tarot. This is a deck that started with a bold image of the 10 of Swords accompanied by the strapline “Everything is Fine”. As each new card has been revealed, Lisa’s following has seriously grown – this looks set to be a phenomenal deck! 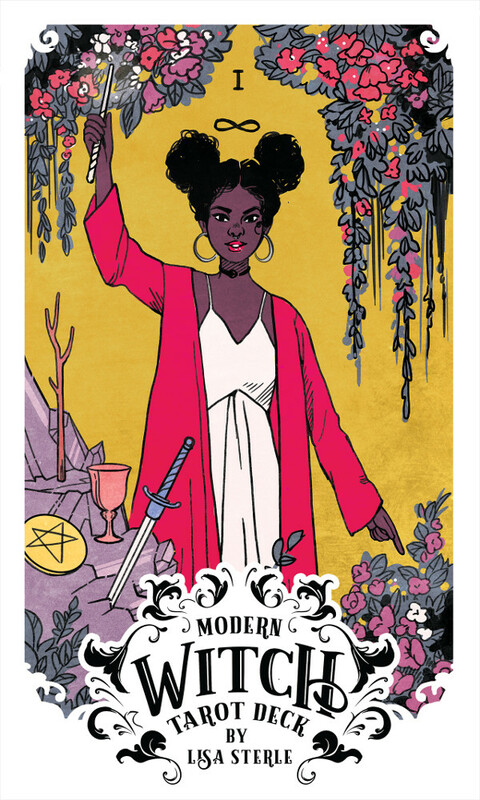 The Modern Witch Tarot will be released in autumn 2019, but we very much look forward to releasing preview images along the way. Stay tuned! We were delighted to learn this week that the incredible Tillie Walden has been nominated for two Eisner Awards for her beautiful and moving graphic novel Spinning (categories: Publications for Teens, Reality-based Work). Huge congratulations to Tillie for a recognition that is truly deserved. If you don’t own a copy of Spinning already, we thoroughly recommend you seek one out now! 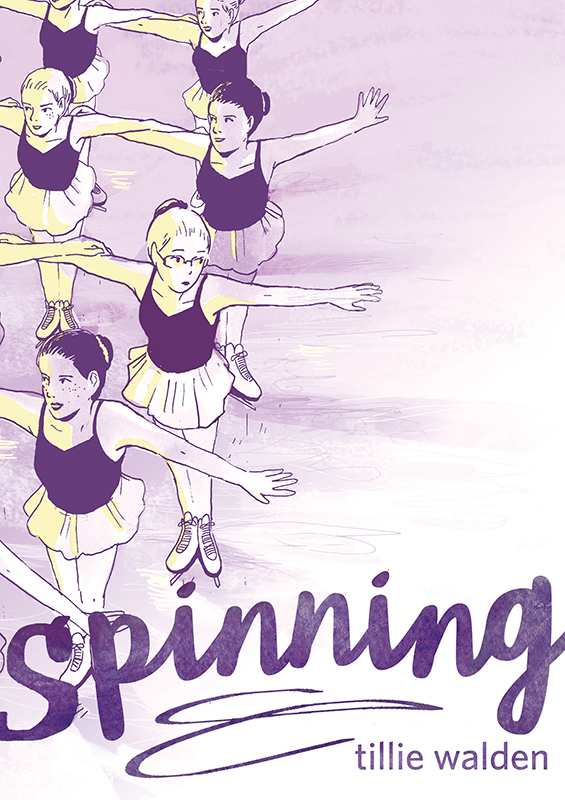 Spinning by Tillie Walden – nominated for two Eisner Awards! 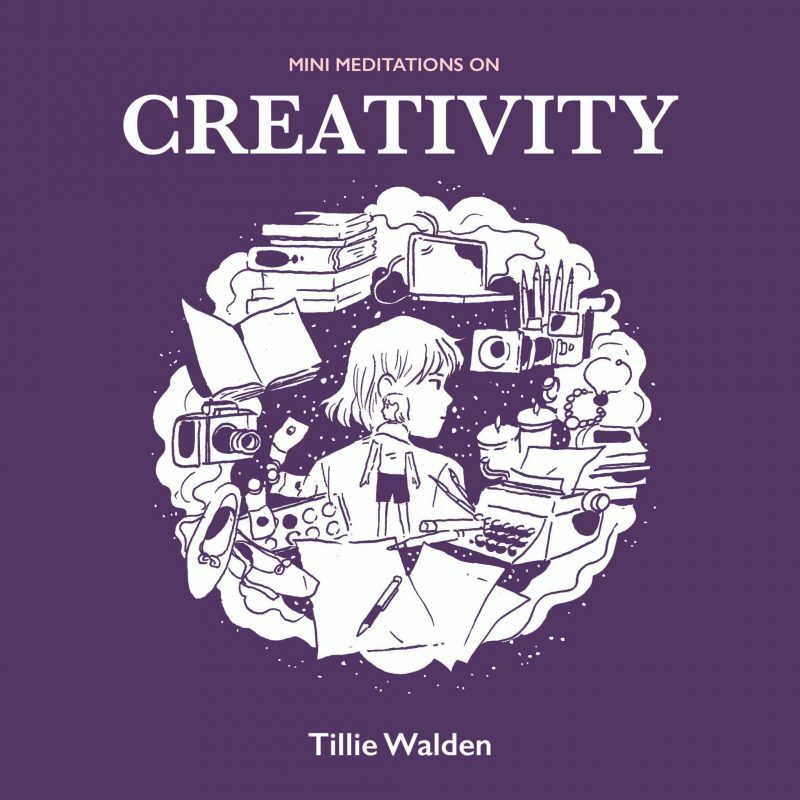 In the meantime please look out for a fabulous new illustration from Tillie’s forthcoming Autumn 2018 publication, Mini Meditations on Creativity, this Friday. It has been an absolute pleasure to share these and see such a joyful response from Tillie’s fans! We cannot wait to open the pre-orders in July.